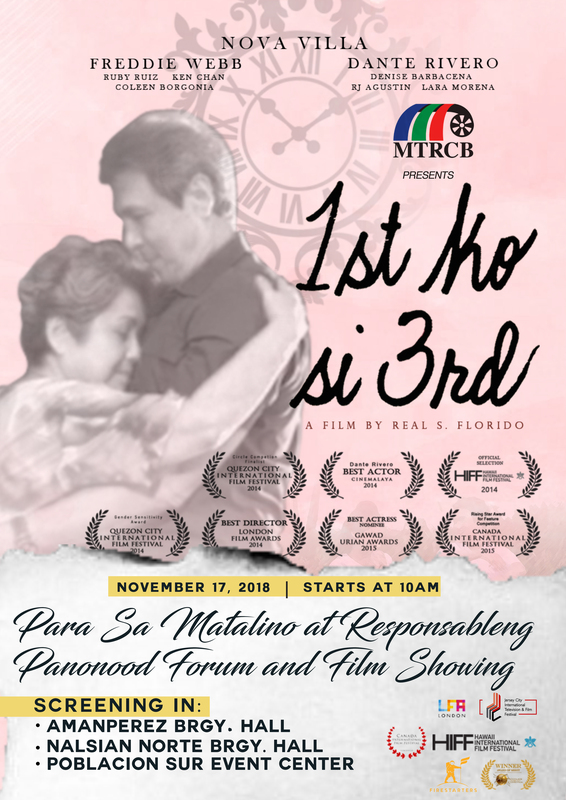 MTRCB once again partnered with Firestarters to push for its banner campaign Para Sa Matalino at Responsableng Panonood Forum & Film Showing. There will be a three simultaneous film screening in Pangasinan on November 17, 2018, 10am in Aman Perez Barangay Hall, Nalsian Norte Barangay Hall and Poblacion Sur Event Center. 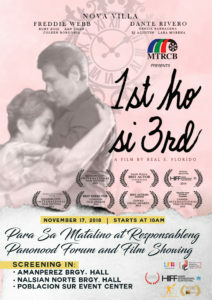 This will be a whole day forum and film showing features the award-winning film 1ST KO SI 3RD directed by Real S. Florido. The film starred Nova Villa, Freddie Webb, Ken Chan, RJ Agustin and Dante Rivero who won Best Actor Award during Cinemalaya 2014. This is the 2nd time MTRCB partnered with Firestarters Productions for its campaign. The film 1ST KO SI 3RD was also screened during the government agency’s campaign for Senior Citizens.